An upcoming addition to the Navy’s fleet may be the USS Harvey Milk if Rep. Bob Filner, D-Calif., and other San Diego gay rights leaders have their way about it. The GLBT Historic Task Force of San Diego County and Filner sent letters to Navy Secretary Ray Mabus and Defense Secretary Leon Panetta last week asking for Harvey Milk to be considered as a name for a submarine, carrier or other appropriate vessel, according to a PR Newswire press release. Milk, a late civil rights icon, was a Navy veteran who served aboard the submarine rescue ship Kittiwake as a diving officer during the Korean War. He went on to be a diving instructor at Naval Station San Diego. Milk, whose parents both also served in the Navy, was honorably discharged at the rank of lieutenant junior grade. In his letter, Rep. Filner wrote “this action would be a fitting tribute to Mr. Milk’s support for equality, an ideal exemplified in the military’s recent repeal of its former Don’t Ask, Don’t Tell policy,” according to the press release. The request comes after a series of controversial namings, such as the littoral combat ship Gabrielle Giffords or destroyer Lyndon B. Johnson, that have caused Congress to ask Mabus for a report due in June detailing the process that Navy uses to name ships. Interesting… I didn’t know he was Navy. How cool. Well, since the Navy has already named ships for every posthumous Navy and Marine Corps MOH, Navy Cross, Silver Star, and Bronze Star w/V awardee, I believe this would make total sense at this time. Mr. Milk did NOT serve and does NOT deserve any honor. Political correctness does NOT apply to the Navy…….where real men serve and die for their country. Harvey just made money off the city of San Francisco. Sorry he died, but he deserves nothing from the USN. He served in a non-combat role………what military action deserves him to have a ship named after him…….I can give 10 more deserving men that died in combat. Name a ship for him because he was gay? Give me a break. If ever a Navy veteran deserved a ship named after him, it would indeed be Harvey Milk. He was extremely proud of his service and, in fact, was wearing his Navy belt buckle when he was assassinated. He did a considerable amount to raising up a minority that had long been oppressed. His story is a classic American story and this would be a fitting honor. Rlgrot: Give it a rest. Did he or did he not serve make up your mind. He voluntarily joined the U.S Navy and served as an officer with honor and great pride during the Korean war. What did Gabriella Gifford do to deserve a LCS-10? NO! NO! NO! Does promoting a disgusting and immoral lifestyles make Mr. Milk elgible for being the namesake of a naval ship? There are more than enough unrecognized sailors in Ironbottom Sound to name naval vessels for the next few hundred years. Mr. Milk has done nothing to warrant naming a ship after him even a floating drydock or a garbage scow. LBJ is another one that does not deserve having his name on a naval vessel. Sec’t Mabus needs to be called to account about this. Concur with PR1………..Rlgrot: “he deserves nothing from the USN”…… I don’t think he’s asking!!! 1. Agree with Natch on the decline of ship-naming standards. The entire concept of naming carriers after presidents and others instead of traditional names was a bad idea to begin with–and not just with respect to Ford and Carter. Once that door was opened it was bound to get out of hand. 2. 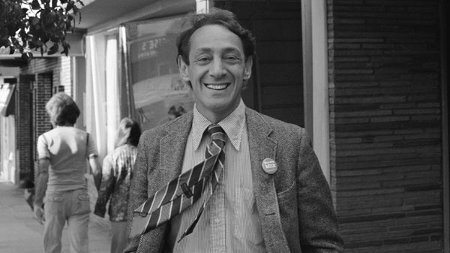 Harvey Milk should not have a ship named after him simply because he served honorably–which he did–or because he was gay–which is clearly the main motivation behind the proposal. 3. On the other side of the issue, no one should be DENIED a ship being named after him because of “a disgusting and immoral lifestyle” as Tom Hawkins (comment #9) says. He thereby undermines an otherwise good comment. 4. Gabrielle Giffords should NOT have had a ship named after her either. 5. States, cities, battles, traditional ship names (Enterprise, etc), truly great admirals (there is only a handful or these) and even presidents who have been dead long enough for their historical legacy to be clear (Washington, Lincoln, FDR) are all OK. Why are we naming carriers after living ex-Presidents, and former heads of the Senate Armed Services Committee (Stennis, Vinson)? It’s totally out of control. Call it “The Good Ship Lollipop”. this will give a formal name to “Shag Ships” or as we US Marine’s use to call them “USS Twinkies”.